In his recently updated book, author and property investor, Michael Yardney explains how the average investor will continue to make the same mistakes with their property portfolios. This means they could miss out on the next property investment cycle. Yardney shares his secrets, so you don't make the same mistakes! Bryce Harrison reviews Yardney's book, How to Grow a Multi-Million Dollar Poroperty Portfolio. 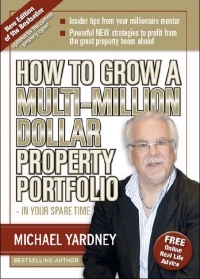 In his fully updated 3rd edition of the best selling property book, Michael Yardney comes across as a guy who really knows his stuff - as he well should with over 35 years' of successful experience in all areas of property investing. I found it a very informative and entertaining read which felt more like I was sitting having a conversation with the author than reading his book. Yardney clearly explains why the gap between the rich and the average Australian is going to increase further as a result of the after effects of the Global Financial Crisis, and why the "old" rules and myths surrounding money simply will not work in this new financial era. He also explains how we are moving into a new property cycle which will be a time of opportunity for some, but suggests the average Australian will continue to make the same investment mistakes they have made in the past and will miss out on the "fortunes" that could be made - unless they learn the "rules" of property investment. The author begins with a bit of an introduction and assurances to the reader that the strategies in the book are not theory, but he has used them himself to amass a significant property portfolio and they have been used by readers of previous editions to create their own wealth as well as hundreds and hundreds of clients. This section begins with who Yardney is and some of his story so far. The next chapters go on to explain what real wealth is, the reasons why investing in residential real estate is such a good idea and how leverage and capital growth really work. Yardney also presents his powerful model of the four levels of investing, which helps clarify where readers are in their journey to financial independence. The second section explains why the author believes investors should invest for capital growth and not cash flow, what can happen to property values in 10 years and what the reader can learn form demographic trends. In the third section of his book Yardney stresses that timing is one of the keys to maximising returns from property investment and discusses countercyclical investing and the economic clock. He then explains how to chose where to buy - locations that will outperform average capital growth and then lays out his (until now) unwritten rules for selecting a top performing investment property. In this section the author provides tips on dealing with real estate agents, strategies for bidding at auctions, the art of skilful negotiation and how to master the emotions when buying and selling real estate. Number crunching and advanced strategies. This section deals with the numbers side of property investing including the tax advantages of owning residential property, about banks and borrowing, valuations, refinancing, renovations and property management. Yardney then reveals what he calls "the ultimate property investing strategy" - living the life of a property multi-millionaire. I'm not going to tell you what this is in this review; you'll have to read the book. How to Grow a Multi-Million Dollar Property Portfolio- in your spare time is written with both beginners and experienced investors in mind and this new edition of the book is destined to become a "must read" best seller for anyone seeking financial freedom as Australia enters a new property cycle. This is not just another book on property investing, but a timely powerful plan for the average Australian to become financially independent by growing their owning multi - million dollar property portfolio.